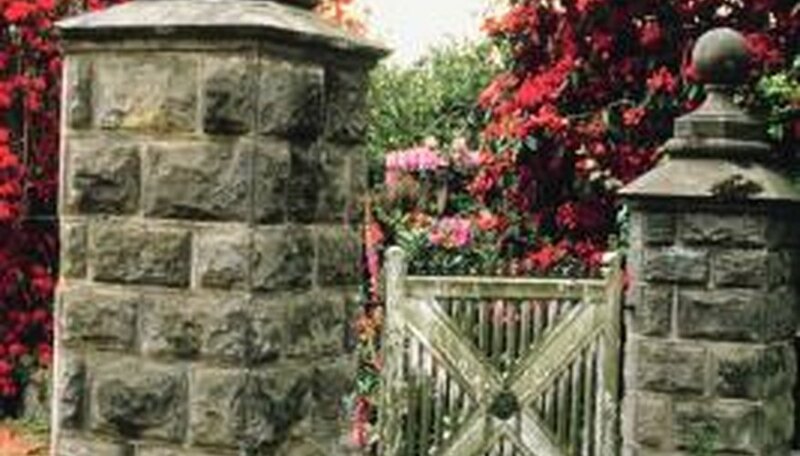 Building a stacked rock and mortar column is one of the classic ways to beautify the entrance to your home. Use small rocks with a minimum width of 4 inches and a length between 6 inches to 1 foot so they can be easily lifted and placed. Rocks of this size usually weigh between 10 and 25 pounds, depending on the height, so there is no need for a small crane to lift and place them. All rock pillars need a strong foundation to bear the weight of the column and resist movement from frost heave in cold climates. Contact your local building department to find out the requirements for footing depth and to determine if a building permit is needed. Rock pillars that are more than 4 feet high may require drawings that are stamped by a professional engineer. Prepare a sketch of the rock pillar to estimate the number and size of rocks required. Dig an area for footing with the shovel. Fill the bottom 6 inches of the hole with clear aggregate. If you want to have a squared-off concrete base that is above the ground and visible, form the scrap pieces of wood into a square shape that is 6 inches larger than the width of the pillar. Ensure that the four pieces of wood are nailed together at 90-degree angles, and attach cross bracing with other scrap wood for support. Place the square-shaped wood in the proper position with the cross bracing on the upper side so that it forms the outer edge of the concrete base. Mix concrete in the pail or tub with the concrete mixer. Pour concrete into the hole and the wooden concrete form so that the concrete will be 4 to 6 inches above the ground. Level off and smooth the concrete with a wire brush, trowel or sandpaper. Allow concrete to set and dry at least 24 hours before laying out the rocks. Mark off the desired location of the rock pillar on the concrete base with a pencil. Choose four flat pieces of stone for the cornerstones. With a hammer and chisel, smooth off the bottom of the rock so that it will lie flat on the concrete base. Mix concrete in a tub or pail with the concrete mixer and apply a 1-inch layer to the concrete base. Set cornerstones in the proper position. Fill in the spaces between the cornerstones with more rocks and concrete. Continue to set the rocks in the concrete, laying out the cornerstones first. As you approach the maximum height of the pillar, use the hammer and chisel to shape and size the rocks so that the top of the pillar will be flat. Finish off the pillar by applying a layer of concrete to the top of the pillar and then set the coping stone squarely on top. Janis Fedorowick's portfolio includes landscape and construction projects around the world. She has published articles in trade journals since 1993 highlighting her research and professional projects, and has written and edited two design books. She is thrilled that her first novel will soon be published. She holds a master's degree in landscape architecture.